I was helping a company a few months ago that got hit hard by recent algorithm updates. When digging into the audit, there were a number of problems that were surfaced, including content quality problems, technical SEO problems, user experience issues, and more. From a content quality perspective, the site had an interesting situation. Some of the content was clearly lower-quality and needed to be dealt with. But they also had a tricky issue to figure out. They target a younger audience and a lot of the content was long-form. And I mean really long-form… Some of the articles were over three thousand words in length. I asked my client if they did any type of user testing in the past to determine if their target audience enjoyed their long-form content or if they wanted shorter and tighter articles. It ends up they never ran user testing and didn’t really know their audience’s preference for content length. Like many site owners, they were pretty much guessing that this was the right approach. The site owner said, “I wish there was a way to determine how far people were getting into the content…” That’s when I responded quickly with “you can do that!” Google Analytics is a powerful tool, but many just use the standard setup. But if you leverage Google Tag Manager, you can set up some pretty interesting things that can be extremely helpful for understanding user engagement. That’s when I recommended using a three-pronged approach for helping identify user engagement, content consumption, etc. I told my client we could triangulate the data to help identify potential problems content-wise. And the best part is that it doesn’t take long to set up and we used one of the most ubiquitous tools on the market – Google Analytics (with the help of Google Tag Manager). Note, there’s nothing better than running actual user testing. That’s where you can watch users interacting with your site, receive direct feedback about what they liked or didn’t like, and more. It’s extremely powerful for truly understanding user happiness. But that shouldn’t stop you from leveraging other ways to understand user engagement. What I’ll explain below can be set up today and can provide some useful data about how people are engaging with your content (or not engaging). The three analytics methods I recommend using to help identify problematic content include Scroll Depth Tracking, Adjusted Bounce Rate (ABR), and then Average Time On Page. I’ll go through each of them below so you can get a feel for how the three can work together to surface potential issues. Note, there isn’t one metric (or even three) that can 100% tell you if some piece of content is problematic. It’s part art and part science. There are times you can easily surface thin or low-quality content (like thousands of pages across a site that were mistakenly published containing one or two lines of text). But then you have other times where full articles need to be boosted since they are out of date or just not relevant anymore. And once you identify potential issues content-wise and dig in, you can figure out the best path forward. That might be to enhance or boost that content, you might decide it should be noindexed, or you might even remove the content (404). In October of 2017, Google Tag Manager rolled out native scroll depth tracking. And the analytics world rejoiced. 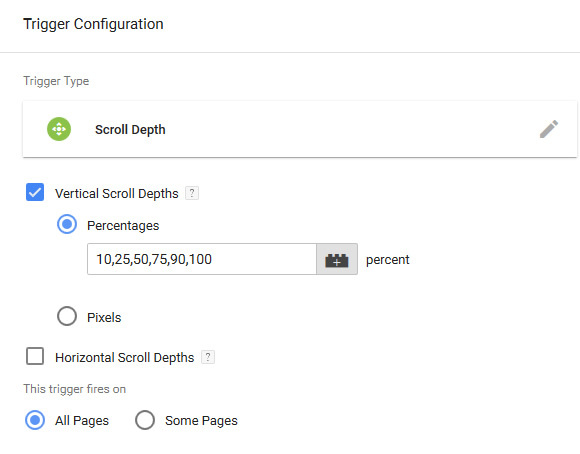 Using scroll depth tracking, you could track how far down each page users were going. And you have control over the triggers percentage-wise. For example, you could track if users make it 10, 25, 50, 75, and then 100 percent down the page. 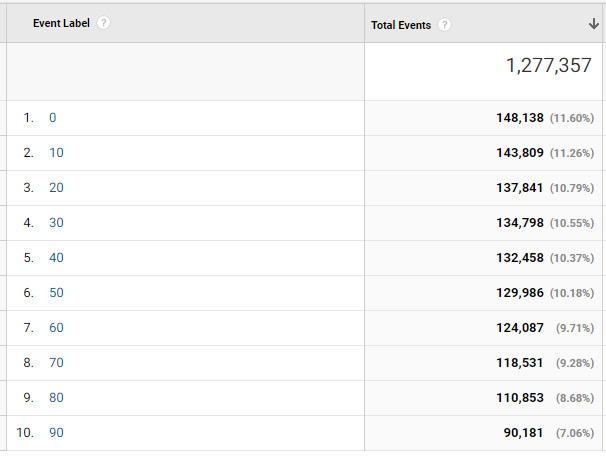 And then you could easily see those metrics in your Google Analytics reporting. Pretty awesome, right? For my client, this alone was amazing to see. Again, they wanted to make sure their core audience was reading each long-form article. If they saw that a good percentage of users stopped 25% down the page, then that wouldn’t be optimal… And if that was the case, then my client could adjust their strategy and potentially break those articles up and craft shorter articles moving forward. I won’t cover the step-by-step instructions for setting up scroll depth tracking since it’s been covered by many people already. 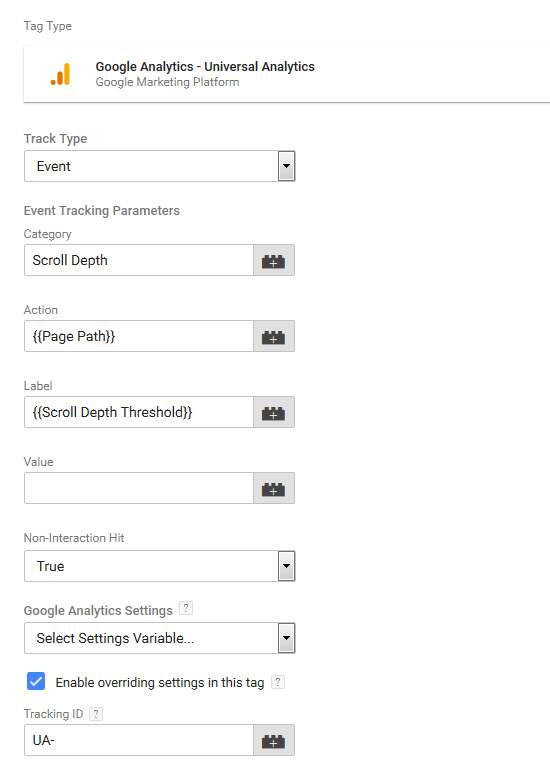 Here’s a great post from Simo Ahava on how to set up scroll depth tracking via Google Tag Manager. It doesn’t take long and you can start collecting data today. And on the flipside, here’s a piece of content where many aren’t making their way down the page. It’s a lower quality page that isn’t seeing much engagement at all. There’s clearly much less traffic as well. Ah, an oldie but goodie. In 2014 I wrote an article about how to set up Adjusted Bounce Rate (ABR) via Google Tag Manager. You can check out that post to learn more about the setup, but ABR is a great way to get a stronger feel for actual bounce rate. My post explains the problems with standard bounce rate, which doesn’t take time on page into account. So standard bounce rate is skewed. ABR, on the other hand, does take time on page into account and you can set whatever threshold you like based on your own content. For example, if you write longer-form content, then you might want to set the threshold to longer (maybe a minute or longer). But if you write shorter articles, then you might want to set the ABR threshold to shorter (like 30 seconds or less). 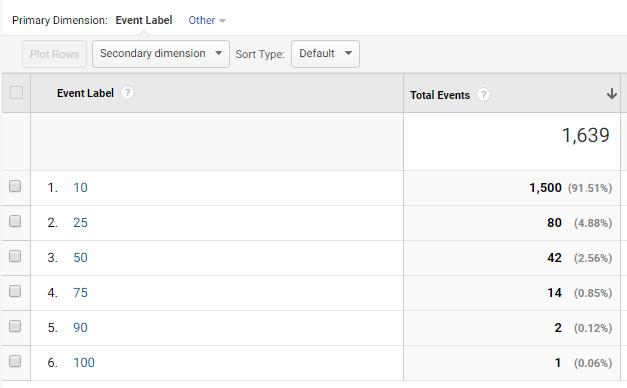 Once the time threshold is met, Google Analytics will fire an event causing the session to NOT show up as a bounce (even if the person only visits one page). Here is an example of two highly-engaged posts of mine about major algorithm updates. The adjusted bounce rate is just 12% for one and 13% for the other. Many people visiting these pages spend a lot of time reading them. So even if that’s the only page they read, it shouldn’t be counted as a bounce. So, now we have two out of three metrics set up for helping gauge user happiness. Next, I’ll cover the third, which is Average Time On Page (a standard metric in Google Analytics). When combining all three, you can better understand if visitors are staying on a page for a certain amount of time, how far they are scrolling down the page, and then how long they are staying overall on that page. Therefore, Average Time On Page will tell you how long users are staying on a piece of content when they visit another page on the site. Sure, it excludes bounces (so it’s not perfect), but it’s still smart to understand time on page for users that click through to another page on the site. 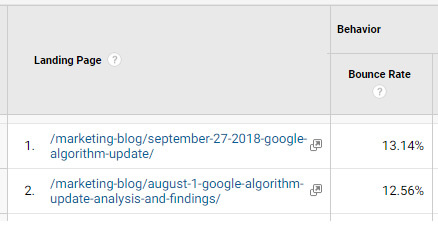 As an example, here’s my post about the August 1, 2018 algorithm update. The Average Time On Page is 12:48 for the responsive page and 17:52 for the amp version. In web time, that’s an eternity. And on the flip side, here’s a page from a different site that needs some help. It hasn’t been updated in a while and users are identifying that pretty darn quickly. Even for people that click through to another page, the Average Time On Page is just 0:55. That’s a major red flag for the site owner. 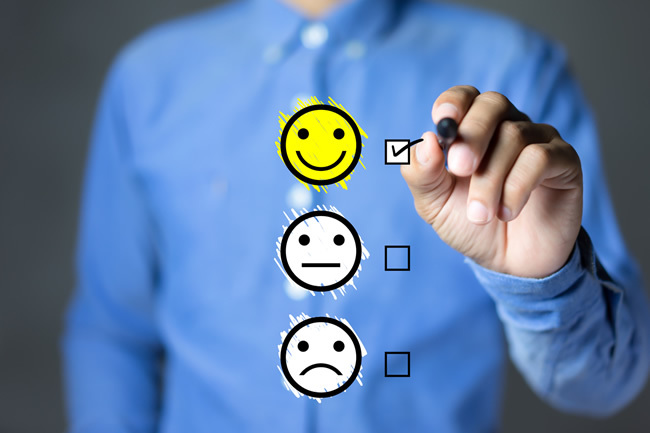 Now that I’ve covered three methods for better understanding user happiness and engagement, I wanted to cover some final tips. Once you are collecting data, you can slice and dice the information in Google Analytics several ways. First, review all three metrics for each piece of content you are analyzing. If you find high adjusted bounce rate, low scroll depth, and low average time on page, then there’s clearly an issue. Dig in to find out what’s going on. Is the content old, is there a relevancy problem based on query, etc.? You might find content where scroll depth looks strong (people are scrolling all the way down the page), but adjusted bounce rate is high. That could mean people are quickly visiting the page, scrolling down to scan what’s there, and then leaving before your ABR time threshold is met. That could signal a big relevancy problem. You can use segments to isolate organic search traffic to see how users from Google organic are engaging with your content. Then you can compare that to other traffic sources if you want. You can also segment mobile users and view that data against desktop. There may be some interesting findings there from a mobile perspective. I always recommend conducting user studies to truly find out what your target audience thinks about your content. You can watch how they engage with your content while also receiving direct feedback about what they liked or didn’t like as they browse your site. But you can also use analytics as a proxy for engagement and user happiness (which can help you identify content quality problems or relevancy issues). By combining the three methods listed above, you can better understand how users are engaging with your content. You’ll know if they are staying for a certain amount of time, how far they are scrolling down each page, and then you’ll see average time on page (excluding bounces). It’s not perfect, but it’s better than guessing. And once you collect the data, you may very well choose to refine your content strategy. And the beautiful part is that you can start collecting data today. So go ahead and set up scroll depth tracking and adjusted bounce rate. Then combine that with average time on page so you can use the three-pronged approach I covered in this post. Leverage the power of Google Analytics and Google Tag Manager (GTM). You never know what you’re going to find.